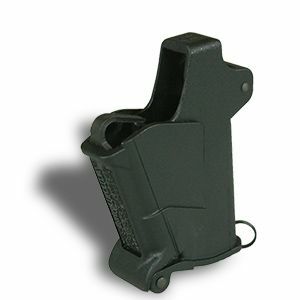 Maglula Ltd. BabyUpLula 22lr - 380acp Single Stack - The BabyUpLULA™ is a high-quality pistol magazine loader and unloader designed for loading virtually all* .22 LR to .380 ACP* (9mm Short/Kurz) single-stack narrow-body <1/2″ mags which have normal / moderate angle of lips. It does so easily, reliably, and painlessly. Low quality Chinese counterfeit loaders cloning our patented UpLULA™ universal pistol magazine loaders are offered for sale on Amazon and eBay, and elsewhere. Please refrain from ordering loaders there. If you suspect receiving a counterfeit loader, please take few pictures of packaging and loader and send it to info@maglula.com. We’ll let you know counterfeit or genuine.